Cabbages belong to the nutrient-dense cruciferous vegetable family, which includes broccoli, Brussel sprouts, and collard greens. Cabbages are known for their relatively high nutrient content. Despite this, cabbage is also ranked among the cheapest vegetables around the world. This makes it both healthy and economical to eat this humble vegetable. Cabbages, and generally all cruciferous vegetables, are known for their potent anti-cancer properties. Cabbages are rich in sulphoraphane, a compound that impedes cancer-causing enzymes. The vegetable is also packed with the antioxidant anthocyanin that help slow down cancer cell proliferation. Previous studies have shown that cabbages help prevent the onset of melanoma, breast, and esophageal as well as gastrointestinal, prostate and pancreatic cancers. The high anthocyanin content in cabbages are also found to suppress inflammation. Cabbages are also known to contain high levels of flavonoids and polyphenols that inhibit platelet build-up and lower blood pressure levels. The vegetable is also an excellent source of potassium that prevents hypertension. The potassium in cabbages acts as a vasodilator that promotes easier blood flow in the arteries and veins. This makes cabbages an ideal go to food for heart disease prevention. The vegetable is also rich in beta-carotene that promotes eye health and helps prevent the onset of macular edema and cataract. In addition, cabbages are also known to promote brain health. The high vitamin K and anthocyanin in cabbage are essential in keeping the neural nerves protected from damage and decay. The cabbage’s rich vitamin K levels help prevent the onset of various cognitive issues such as neural degeneration, Alzheimer’s disease, and dementia. The high fiber content in cabbages are also essential for weight loss and overall digestion. Cabbage is also rich in water that prevents constipation. In addition, the vegetable is an important detox food that rids the body of toxins, especially free radicals and uric acid. The vegetable is also known to promote bone and skin health. Furthermore, cabbage is notably high in antioxidants that stave off a plethora of diseases ranging from common cough and colds to more serious conditions such as rheumatism, skin diseases, and muscle aches. Cabbage is among the healthiest vegetables that offer a large number of benefits. The vegetable’s high antioxidant content and potent cholesterol-lowering properties greatly benefit the heart, the digestive system, and the immune system. The vegetable is also notable beneficial to the brain, the muscles and the skin. In addition, the vegetable’s detoxifying properties help boost the body’s over all health. With cabbage being an economical vegetable, it can be used in a variety of recipes. The vegetable is primarily used in slaw and salads, but can also be incorporated in soups, roasts and sauces. Cabbages also keeps Alzheimer’s disease and dementia at bay. The vegetable may also reduce the odds of developing ulcers, skin diseases, and premature aging. 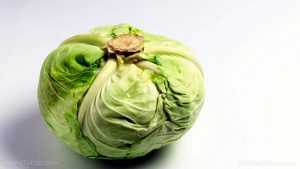 Cabbages benefit the heart, the brain and the digestive system, as well as the bones, the skin, and the immune system. Raw cabbage has the most health benefits. It has excellent antibacterial and antiviral properties.